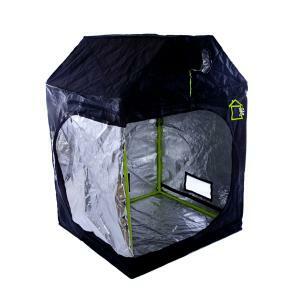 The Roof Qube RQ120 Grow Tent is a great solution for those who want to grow in a loft or attic space. The Roof Qube tents are high quality and the slants in the roof mean that this tent will help you take advantage of the space you have. Great product! The Roof Qube RQ120 Grow-Tent is a quality grow-tent that has a slanted roof so that you can take full advantage of the space that you have. The tallest part of the tent (from floor to highest part) is 1.8 metres while the height of the tent at the shoulders is 1.4 metres. The frame of the tent is made from very strong metal tubing with metal corner pieces and the roof has 2 extra rails for hanging your reflector and carbon filter from. The fabric of the tent is very tough, light-proof, incorporates tough zippers and has a very highly reflective silvered interior to ensure you can make the most of the light from your lamp. The tent incorporates 4 x 8" (200mm) ducting points and a 4" (100mm) cable entry point. All the ducting and cable entry points incorporate a sleeve with a draw-string fastener to ensure there are no light-leaks into or out of the tent. The rear and sides of the tent each have a rectangular ventilation panel with an integral bug-screen and a velcro-fixed cover-flap. It is usually wise to erect the Roof Qube tent in the room/loft/attic-space in which it is going to be used as it is difficult to fit through doorways and loft-hatches. Erect the tent as per the supplied instructions, making sure that the right poles are used in the correct places. The tent fabric should fit snugly over the frame without you having to yank or heave on it. If you are having difficulty fitting the fabric over the frame, stop and check the frame has been put together correctly. Pulling too hard on the fabric may cause stretches or damage to the seams, zippers or even the frame. If you still have difficulties, give us call at the shop and we will try to help! Hang your filter and/or duct-fan from the hanging rails and feed ducting out through the most convenient ducting entry point. Inlet ducting can also be fed in through the most convenient ducting point. Fit your reflector and lamp from the hanging rails so that it hangs approximately in the centre of the tent. Easy-rolls are ideal for this. Feed your power cables out through the most convenient cable entry point. On each of the entry points pull the drawstrings tight around any ducting and cables and pull the drawstrings tight on any unused entry points to help keep the tent light-tight. Your grow-tent is now ready for use. Roof Qube RQ120 - 1.2m x 1.2m x 1.8m (1.4m) - Grow Tent Silver dimensions: 1200mm wide x 1200mm deep x 1800mm high (1400mm at the shoulders). Roof Qube RQ120 - 1.2m x 1.2m x 1.8m (1.4m) - Grow Tent Silver ducting/cable-entry points: 1 x 8" (200mm) on the front, 2 x 8" (200mm) on the rear, 1 x 8" (200mm) on the right side, 1 x 4" (100mm) on left side.